Antique jewelry lovers will find book chain necklaces charming. The elegant book chain design was a popular Victorian jewelry design choice for styles such as lockets, cameos and all chain necklaces. Book chain style necklaces refer to a design involving a chain with links that are shaped like books. This design emerged during the Victorian era and was popular through the Edwardian period. In fact, it was still a standard design during the transition from Art Nouveau (1890s to 1905) to Art Deco (1925 to 1945) jewelry era. Book chain jewelry was especially popular during the Victorian jewelry revival during the late Art Deco era of the 1930s and 1940s. The book chain style has also come back in fashion at various times during the 21st centuries in the form of Victorian inspired or neo-Victorian jewelry. 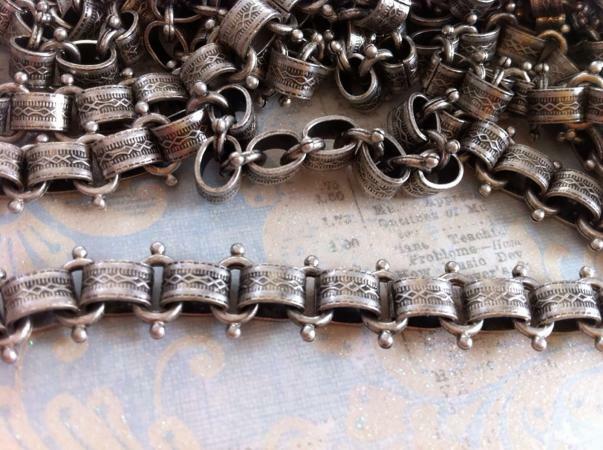 When most people think of book chain jewelry, they consider it a Victorian style. Victorian book chain jewelry designs were elegant and included some of the most intricate artistic details on each book link such as engraved filigrees and scrollwork. Necklaces and bracelets were the most common forms of jewelry featuring book chain. Most Victorian book chain jewelry was made out of copper, gold, brass or gold-plated metal. During the Art Deco era of the 1920s to 1940s, the book chain jewelry featured styles that closely resemble some of today's modern jewelry style. The Victorian era included a larger number of long necklaces. During the Art Deco era, there was a larger selection of choker necklaces and short necklaces, such as fringe and bib necklaces, that could be worn with more open neck style of clothing woman wore. Some designs were bolder, bordering on gaudy. Today many jewelry artists seek to capture the look of book chain style necklaces in Victorian-inspired or neo-Victorian designs. Most modern Victorian inspired jewelry is made out of antiqued brass or copper, with some versions in gold or sterling silver. The modern book chain jewelry often merges the styles of Victorian and Art Deco jewelry under the Victorian inspired name. Necklaces include traditional cameos on long chains, choker styles with intricate scrollwork and many fringe bead and brass stamp designs. Shopping for book chain style necklaces may be a challenge in many locations. Antique and vintage book chain pieces are rare. Modern Victorian inspired designs may be easier to locate. Craft shows and art fairs are also good places to find Victorian inspired book chain jewelry. However, the Internet provides many resources for finding antique and modern book chain jewelry. Ruby Lane: Ruby Lane generally has a large selection of book chain jewelry available, including necklaces. Ruby Lane's book chain jewelry includes original Victorian pieces as well as items from the 1930s and 1940s. Penelope's Pearls: The Penelope's Pearls site often has book chain style necklaces for sale from the Victorian era. Morning Glory Jewelry: Morning Glory Jewelry commonly carries several book chain style necklaces from either the Victorian or Art Deco eras. Nouveau Motley: Nouveau Motley's Etsy shop sells handmade Victorian inspired jewelry. The designer generally has several book chain style necklaces for sale. Both antique jewelry collectors and admirers of neo-Victorian jewelry should consider book chain necklaces. The exquisite designs and their intricate detail of each piece truly capture the beauty of an earlier era where fine craftsmanship was the standard.